For the record, not everything in L.A. is nouveau. 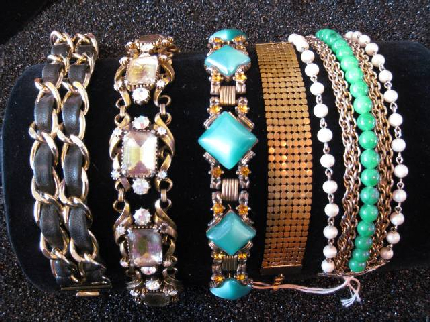 Take The House of Love & Luck, which is, yes, new, but which also sells amazing vintage bijoux. According to LAist's lifestyle goddess Julie Wolfson, Ricki Nolan's shop opened on La Cienega 6 weeks ago (which I love cause, well, that's my hood), stocking carefully chosen finds, deeply seeped in history. And, best of all, the hand-picked statement pieces (unexpected gems lifted from the metaphoric POCKET LINT, if you will–hee) range in price from $30 to $400. So, you can spend a little for something you'll wear a lot, right? See, as long as it's possibly Depression Era again, might as well dress the part too. NOUVEAU Depression Era, that is.